Pinus wallichiana is an attractive, pyramid forming conifer with unique drooping, long thin green pines that drape over branches like silk tassles. It’s soft evergreen foliage and form make a very interesting year round feature. Small cones are produced in November adding another element of interest. This lovely Bhutan pine will reach 8 x 5 meters in 20 years and is tolerant of sandy drought prone soils. It is also tolerant of coastal and exposed inland positions but does require full sun. Our pot grown Bhutan Pine trees can be planted at any time of the year. Firstly, remove all weeds and grass within a metre of your desired planting hole, then dig a square hole as deep as your root mass and approximately 2x as wide. To help your tree establish more effectively, you can sprinkle root grow in the hole. Gently loosen the tree roots and place into the planting hole. Mix 50% of the original soil with 50% high quality compost, fill in the hole and firm around gently. Make sure not to bank the soil up around the collar of the tree as this can cause problems. 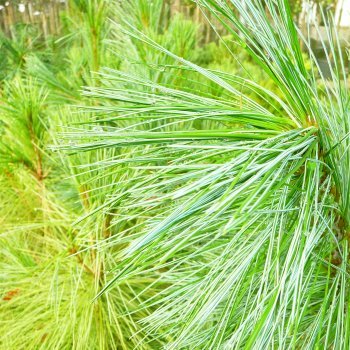 If you’re planting Bhutan Pine in spring, summer or dry weather, water well and regularly for the first few months. If you’re planting in autumn, you may only need to water your tree a little. Bhutan Pine are drought-tolerant once established, but until then, keep an eye on young trees and increase watering if there are extended periods of hot or dry weather. Once planted, keep the area free of competing weeds and grass for the first couple of growing seasons. Installing mulch matting will aid in this. If you know your area is prone to rabbits, we advise using a rabbit guard.